The 1,000-kilometer class cruise missile with the capability to strike deep into the enemy territory has been designed and developed by the DRDO at its Aeronautical Development Establishment. 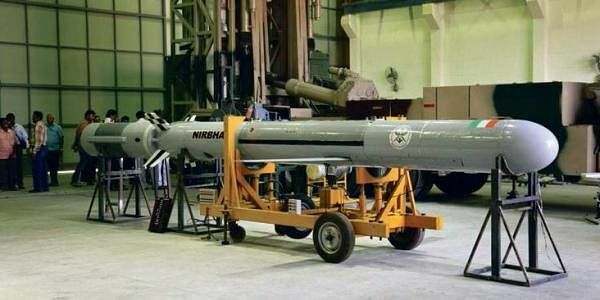 BHUBANESWAR: India on Tuesday test-fired homegrown surface-to-surface subsonic cruise missile Nirbhay from a defence base off Odisha coast. This was the fifth test of the weapon system. The nuclear-capable missile blasted off from a mobile launcher positioned in the launching complex-III of the Integrated Test Range (ITR) at Chandipur-on-sea at about 11.25 am leaving behind a chain of thick smokes. DRDO scientists and all technical staffs involved in the mission cheered up and celebrated as the missile went up vertically before taking a dive and travelling on the pre-designated trajectory. The cruise missile, powered by a solid rocket motor booster developed by the Advanced Systems Laboratory (ASL) took off from a mobile launcher specifically designed for Nirbhay by the Vehicles Research and Development Establishment (VRDE), both being DRDO laboratories. As it achieved designated altitude and velocity, the booster motor got separated, the turbofan engine automatically switched on taking over the further propulsion and the wings opened up by the commands generated by the onboard computer (OBC) stabilising the flight. Guided by a highly advanced inertial navigation system indigenously developed by Research Centre Imarat (RCI), Nirbhay used turbojet engine for the first time. Earlier the weapon was tested with a turbofan engine. Throughout its path, the missile was tracked by ground-based radars while its health parameters were monitored by indigenous telemetry stations. An aircraft also tracked the missile all along its flight. Sources said the initial delay was due to the late arrival of chase aircraft. Once the aircraft was positioned, the launch took place. However, the results of the mission could not be immediately known as data captured during the firing were being analysed. The 1,000-kilometer class cruise missile with the capability to strike deep into the enemy territory has been designed and developed by the DRDO at its Aeronautical Development Establishment (ADE) based in Bengaluru. The two-stage missile has a length of six meters, 0.52 m in diameter, wingspan 2.7 m and a launch weight of about 1,500 kgs. Since it is a low-altitude missile system, it possesses the capability to duck enemy radars and reach targets with high accuracy. DRDO Chief S Christopher was present at the test range during the mission.